Cassidy & Associates is returning to its entrepreneurial roots and focus on client service as it announces a management buyout from The Interpublic Group (IPG) today. 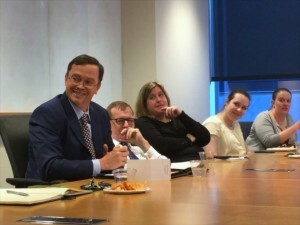 Cassidy CEO Kai Anderson shares news of the management buyout from IPG with staff members. “We are excited to make this strategic investment in our team and our future success. There is purpose in ownership and this investment positions us to deliver even stronger service to our clients,” Cassidy CEO Kai Anderson said. Anderson leads the investor team along with Barry Rhoads, chairman, and Jordan Bernstein, chief operating officer. Anderson noted the firm today has seen steady growth from 2013 when the three took the helm of Cassidy, a seven-percent increase in revenue reported under the Lobbying Disclosure Act (LDA). “Nearly four years ago we re-doubled our efforts to focus on Cassidy’s core competencies. Our action today puts us on a course to empower our people and focus on our founding charge of providing experienced advocacy to deliver exceptional client service and results,” Anderson said. Founded in 1975, Cassidy helped build modern advocacy in Washington and was bought by IPG in 2000. The leadership team of Anderson, Rhoads and Bernstein continue to build the Cassidy team by adding top Hill staff and attracting new clients like Patagonia, DroneShield, Thyssenkrupp, Port of San Antonio and South Coast Air Quality Management District.